Here are parts 1, 2, 3, and 4 of the guide. Also, here’s some background info and some notes before you begin playing. For this review I will not be giving out a score for the game, but just a general recommendation on who should get this and who shouldn’t, while explaining various aspects of the game. My hope is that this review will give people an idea of what type of game it is, and whether or not they would like to play it. I also will be commenting primarily on the ROM version of the game, as I have not played the original version. The Legend of Zelda: Ancient Stone Tablets was an interesting experiment with Nintendo’s line of Zelda games. While the gameplay itself wasn’t very different from its predecessor, the technology used to distribute the game, as well as the streaming orchestrated and voice acting was quite an accomplishment for 1997. The ROM version unfortunately could not include these parts, but replaced the music with appropriate Link to the Past music. The people at ZeldaLegends.net did an amazing with recreating the game, and I have no complaints about their efforts. Ancient Stone Tablets was made to be a competitive game, where its participants were to try to complete the dungeons and find all the secrets as fast as possible. This is why there are results at the end of each episode. Originally players could send in their high scores in order to win various prizes. In addition, the new functionality of the Pegasus Boots clearly helps Link traverse maps much faster and really lends itself to a speed run. Apart from that, the game replicates the enjoyable aspects of Link to the Past dungeons quite well. All of the dungeons do a very good job of allowing you to see future dungeon goals before you can actually reach them. There also were some interesting ideas implemented, like having split paths in one of the dungeons. The revamped Pegasus Boots were a ton of fun to use and work really well. The puzzles themselves were easier than that of the original, but they still required some thinking if you didn’t remember Link to the Past too well. In addition, the original presentation values were superb at the time, as neither voice acting or orchestrated music is even present in current Zelda games. The Legend of Zelda: Ancient Stone Tablets was an amazing game for its competitive purpose. The amount of effort that was put into the presentation of the game, the technology to break apart the game into sections, and the decent dungeon designs is still pretty impressive. This is even more impressive when you consider the fact that this was made for a small audience of around 100,000 customers, and this game was only available for a month. When you consider the length of current downloadable content (DLC) efforts, this four hour game has a lot more content than the majority of present-day DLC. This still holds even when taking out the upped presentation present in the original game, which is all that’s missing from the ROM. In conclusion, if you are looking for an entirely new epic Zelda adventure that innovates in many ways beyond a Link to the Past, Ancient Stone Tablets is probably not for you. 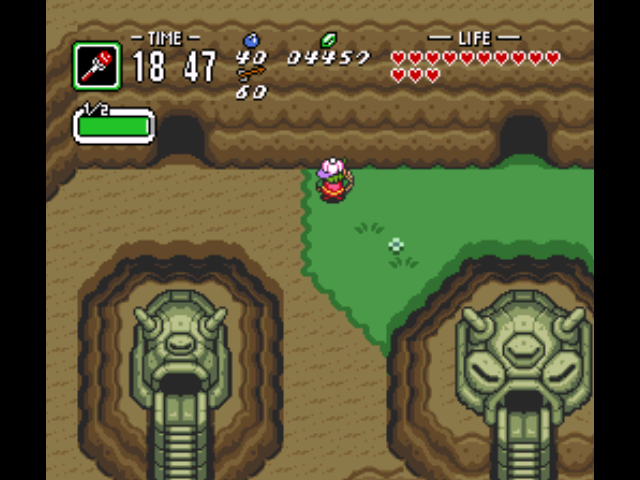 However, if you’re interested in playing through a more compact game with speed-running and quick thinking in mind or are interested in looking for secrets and collecting 1000s of rupees, Ancient Stone Tablets is definitely worth playing. Even if you’re on the fence, I’d recommend trying it out, as trying out the game is currently free, and you may be surprised on what you think of the game. You are right that this isn’t a full fledged zelda game, but it has it’s charm in that you can sit down and beat one episode in one sitting. This game is all about speed runs and the mini games and the ways it takes Lttp elements and creates new puzzles with them is amazing. The weather and how it changes the overworld (rainy storm of zora army death is still freaky) make this game worth your (non)money! I like this game better then Phantom Hourglass and Four Swords. I’m happy to hear someone else has played this game and liked it =). I wasn’t aware that there were patches like that, but I guess I’m not surprised (once you recreate a whole game, it’s probably not too hard to add back a couple weapons from LTTP).